Wai has always been a taonga or highly prized resource of tremendous value to Māori including whānau, hapū and iwi. The Māori relationship with the environment and natural resources, freshwater more specifically, is founded upon whakapapa and whānaungatanga. Empowering rangatahi with the tools for manag ng, assessing and measuring river water quality is the kaupapa of Indigenous Sparks ™ -Equipping 100 reaching 1000 program. 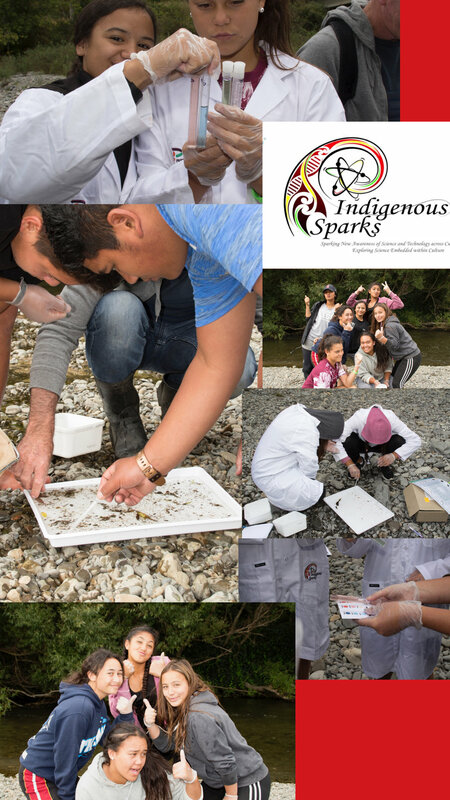 Indigenous Sparks™ offers a year-long, stimulating& integrated initiative that equips year 9-11 rangatahi with scientific and technical skills in river quality monitoring. The program goes further to develop the students’ capacity to utilise a range of technologies in developing innovative products and communicating science learnt back to iwi, peers, Council teams and whanau in a creative& stimulating manner. ▪ Ngā manga iti, ngā manga nui e honohono kau ana, ka tupu hei Awa Tupua - the small and the large streams flow into one another and form one River. "Underlying the Maori thinking about natural resources is the concept of Maori - the life principle that resides in all things. A river is a treasure and it has its own life force. Therefore extraction of water or the introduction of waste into rivers is not just a matter of physical degradation or ecological compromise. It can be seen as an offence in the cultural sense. The river has values stretching beyond the immediate needs of clamouring users." During Term 1, PTC organised a series of river science engagements with Regional councils and NIWA scientists so that students can gain practical, hands-on training in the science behind river quality. The PTC science initiative also desired to ensure that western science is interweaved with a more holistic Māori philosophy, ki uta ki tai (mountains to the sea) approach to looking after water resources. PTC engaged a successful collaboration with iwi to ensure there is effective interweaving of mātauranga within our science and technical approach. The program began with an engaging forum with Dr Marama Muru-Lanning ( James Henare Research Centre, University of Auckland). Anthropologist Dr Marama Muru-Lanning talked about the release of her new book, Tupuna Awa, which looks at the people and politics of the Waikato River. Mr Martin Rutledge, Freshwater Technical Advisor, Mātanga TāongaWai Maori, Science & Policy, Department of Conservation National . Their workshop provided students with a insightful overview of the science and politics of freshwater management. Lindsay Poutama Education Manager for Te iwi o Ngati Tukorehe Trust provided an excellent cultural context and significance of this scientific engagement in strengthening youth to competently express kaitiakitanga. Ngāti Tukorehe plays a large role in conservation by setting aside a wetlands restoration reserve on its tribal farm Tahamata Inc. The kawenata or covenant that protects their wetlands area has been used as a blueprint for other wetland conservation activity regionally. Palmerston North students journeyed to Pohangina river at piripiri and raumai to sample and assess the macro- invertebrate and physio-chemical composition of the river. PTC Trust organised the presence of Tribal leader and Kaumatua Jeffery Rakatau no Ngati Haua me Ngati Kauwhata who imparted his historical and cultural knowledge in appropriate cultural transfer of tribal knowledge on waterways, whenua, karakia and whakapapa. Dr Alex James, Freshwater Ecology Scientist of EOS Ecology led the group through their investigation as he provided first hand experience into a range of topics from ecological impacts of low flows; impacts of development on freshwater ecology and stream rehabilitation. The Manawatū River becomes a source of regional pride and mana. Waterways in the Manawatū Catchment are safe, accessible, swimmable, and provide good recreation and food resources. The Manawatū Catchment and waterways are returned to a healthy condition. Sustainable use of the land and water resources of the Manawatū Catchment continues to underpin the economic prosperity of the Region.